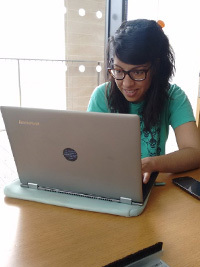 Dr. Jasmeen Kanwal is a postdoctoral research fellow in the School of Biology at the University of St Andrews, working on the social evolution of digital organisms. She studied for her doctor of philosophy at the Centre for Language Evolution at the University of Edinburgh. Her academic interests are in ‘complex systems science’. I didn’t set about wanting to work in any one particular field – I’ve been lucky enough to have been able to just follow my interests and see where they would take me. I did my undergraduate degree in physics and philosophy because at the time I was most interested in the philosophical questions surrounding the theories of modern physics, and I liked the idea of a course that mixed science with humanities. I enjoyed this course so much that I started a Ph.D. in the philosophy of physics. However, because I was allowed to enrol in undergraduate courses for free while studying for the Ph.D., I sneakily enrolled in a few linguistics classes, a subject I’d always been curious about. I was instantly hooked and ended up changing departments and starting a new Ph.D. in linguistics, with a focus on the topic of language evolution – the study of how languages change over time. This field borrows ideas about evolution from biology and applies them to languages – we can think about related languages being descended from a common ancestor (such as Spanish and Italian, both descended from Latin), the same way we can talk about different living organisms being descended from a common ancestor. As I was familiar with these ideas, and the types of mathematical and computational analyses used to study evolution, when a job opportunity arose in a biology department to build computer models of the social evolution of digital organisms, I was hired! Given that I have moved between physics, philosophy, linguistics, and biology departments during my academic career, all the while using very similar methods to study very different systems, I think I could most accurately be described as a ‘complex systems scientist’ – a scientist who studies any kind of complex system that dynamically evolves, using a common set of scientific tools that can be applied across disciplines. The majority of my day involves sitting at my laptop writing computer programs. Sometimes I’ll switch to pen and paper to sketch out ideas, or to do some maths. The computer programs I write carry out all sorts of useful tasks for me. Most importantly, they run simulations of evolving systems and record the data, but I also write programs that analyse the data and draw graphs to help visualise it. These graphs allow me to communicate my results in scientific talks and papers. One of the end goals of my project is to create computer simulations of evolving systems that anyone – even members of the public – can access online and play with themselves, in the form of a simple, intuitive, computer game. In all the fields I’ve worked in I learned about how to mathematically and computationally model systems that change over time. In physics, we looked at systems as small as a few tiny particles, or as large as the entire universe. In linguistics and cognitive science, we looked at signals made by the brain, and the sounds made by people and animals. Now I look at how populations of interacting creatures (‘digital organisms’) can evolve complex cooperative behaviour over time. All the mathematical and computational tools I learned to study the previous systems I described apply here as well. 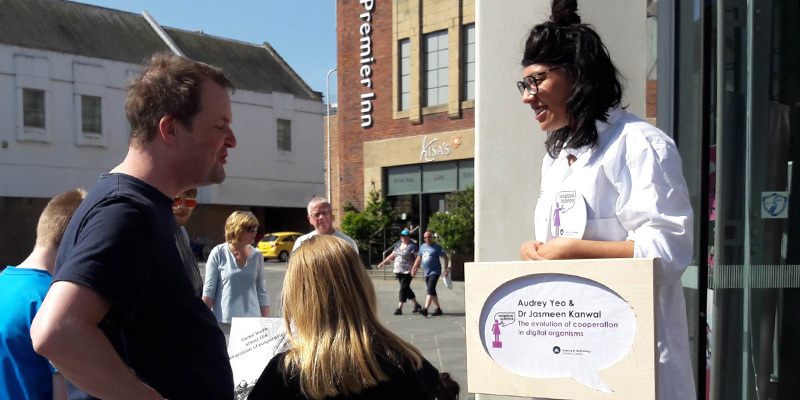 Jasmeen takes to the soapbox! I heard about Soapbox Science in one of our weekly departmental newsletters and I was instantly intrigued. The call was for the Soapbox Art and Science initiative, where a scientist is paired with an artist to collaborate on a joint project. As well as being a scientist, I love being involved with art. I also feel very passionately about the importance of public engagement with science, as well as the importance of promoting diversity in science, so this seemed like the perfect thing for me to get involved in. We prepared our talk by coming up with ideas for an activity that the audience could directly engage with using their hands. The idea we settled upon was to show people pictures of different environments. We allowed them to build their own creatures that would be able to survive in these environments. In this way, people could get a hands-on idea of how the environment shapes the evolution of different characteristics in a species. This idea was beautifully brought to life by the artist I was collaborating with, Audrey Yeo. 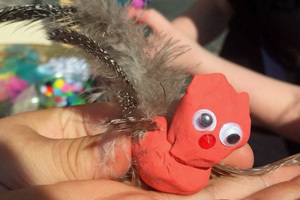 There were lots of small children, and they absolutely loved being able to build their own creatures out of the brightly coloured materials (clay, feathers, beads, etc.) that Audrey brought! Many of the children took their creatures home with them. One of the ways that science progresses is through people coming up with original ideas or making connections that were previously unseen. If everyone in science had a similar educational, social, and cultural background, then it is less likely that new and original ideas would emerge from this homogenous thought pool. Diversity of thought means a better chance of making original breakthroughs. The major thing coming up next for me is that I am expecting a baby in three months’ time! I will then embark on a new challenge – learning how to be a successful working mother.